At the World Chess Championship in 2013, played in then-titleholder Viswanathan Anand’s home country of India, there was a lot of complaining after the first four games of the match about boring Grandmaster draws in chess. With many of the openings in chess at the elite level understood at a very deep level, it can be profoundly difficult to establish winning tactics in a game between two highly skilled players. Consequently, many GM games end in draws. And far more often than fans would like, GMs agree to draws after only about two dozen moves. At this year’s match in Sochi, Russia, the story has been completely different. Reigning champ Magnus Carlsen and Anand, now the challenger, have played a series of enthralling games up to where we are now: Game 9 completed on Thursday, with only three games remaining in the 12-game match. 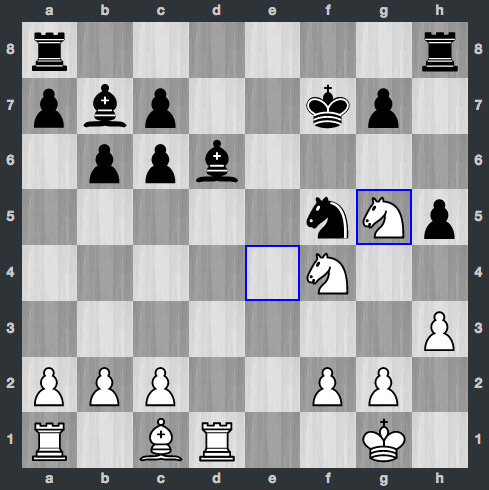 Carlsen has the edge; the score stands at 5-4 in his favour (wins are worth a point, draws count for half a point, and losses equal zero). The stage is set for some serious drama headed into the home stretch. Anand will have two more chances to win, capitalising on the advantage of playing the white pieces. 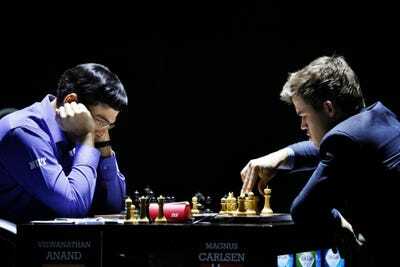 Carlsen will try to maintain his margin and defend his title. The boring GM draw did finally arrive, unsurprisingly in Game 9. 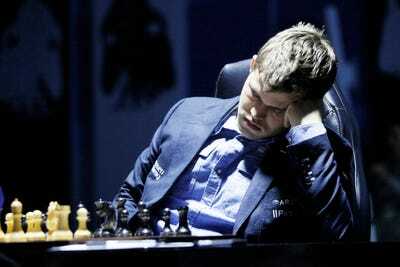 Game 7 was a 122-move marathon (and a draw) that created, in Game 8 (also a draw) the bizarre sight of Carlsen possibly nodding off to sleep at the board — or more likely using thinking to disguise his complete exhaustion. Previous games had been dense, theoretical battles — demanding engagements that took a mental toll on both Magnus and Vishy. Wednesday was a rest day, but it clearly wasn’t enough for the players. So they collaborated on yet another Berlin Defence in the Ruy Lopez opening (my intro to the opening is here), a game plan that quite often leads to draws in GM play. This time around, the game made it to move 20 before a check was repeated and a draw was agreed upon. In fact, according to some of the online commentary, much of the game was essentially a replay of a GM contest from a few years back. Ultimately, nothing too exciting, but this isn’t a single-elimination tournament. It’s match play. At at this late juncture, strategies for getting to the finish are coming into the picture. Carlsen wants Anand to take a chance, go for a win, overextend himself, and provide Carlsen with an opportunity to close to within a half point of victory (the first player to a 6.5 score will become the World Champion). Anand wants to test Carlsen’s preparation: on two occasions in the match, Anand has been able to exploit the 23-year-old Carlsen’s weaker grasp of opening theory. Additionally, Anand looks fairly fresh. His 44-year-old body and brain haven’t let him down yet. The boring GM draw in Game 9 shouldn’t bum anyone out. There were more of them last year, so only one this time around should be tolerable, even understandable. Bottom line: 2014 has indeed been something completely different — and extremely exciting. And now it’s really going to get good. You can watch the replay of Game 9 here. And you can review the game at ChessBase.